Dynamic Buffer Management (DBM) is a tool of the Theory of Constraints, which allows to effectively manage the enterprise reserves by focusing on the actual consumer demand. DBM implementation enables to always have the right product in the right place at the right time. As a result, the level of surplus decreases and losses of sales shorten. Stock buffers are necessary to support the required amount of inventories in the system and provide the constant availability of products for clients. That said, there shouldn’t be surpluses in the system that frozen the floating assets, i.e. the volume of reserves in the system has to be minimal. 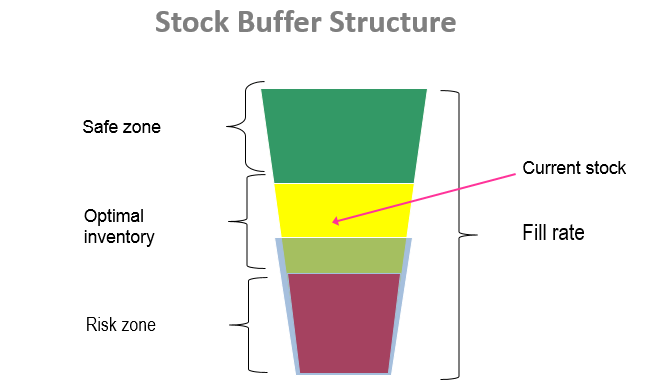 Stock buffer is divided into several zones. Buffer (green-yellow-red zone) defines how many goods are needed for sale between deliveries. Its size is analyzed by the system every day and is measured automatically depending on the surplus change traffic. If the surplus dominates in the green zone – the system reduces the buffer; if in the red zone – the system increases the buffer to its upper value (fill rate). Safety buffer (grey zone) is the guaranteed product display, the amount of goods not for selling, but for “beauty” of a shelf. It’s not managed dynamically. It is determined in order to support the guaranteed display. Surplus in the safety zone of the buffer are accepted by the system as loss of sales (because these goods are not designated for sale). Estimation of stock replenishment for each SKU in each stock location. Dynamic buffer management. Implementation of automatic ordering and inventory management system the company "iSTUDIO"
Transport Management System implementation to reduce transportation costs, improve clients’ service level and provide goods delivery in time.